At first it seemed odd that Glen Johnson has chosen to release an album under his own name, as he already has his Textile Ranch solo project, and many people consider him to be synonymous with Piano Magic. His explanation for the release is that he had a number of new songs ready to record but Piano Magic were on a break and he couldn't wait for the band to get back together. I'm not sure if I believe this, given that regular Piano Magic contributors Jerome Tcherneyan and Angèle David-Guillou feature on "Details Not Recorded". After studying the lyrics and, in particular, the album's artwork, it seems more likely that Johnson is having a minor mid-life crisis and wants to forge an identity for himself separate from the Piano Magic brand. Themes of identity and self-image run through the album. 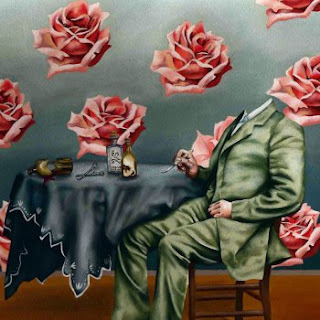 The cover painting, by Chicago artist Julia Haw, suggests someone who has lost his sense of individuality to the extent that his head has become invisible, and the inner sleeve depicts a man (presumably Johnson) with his face hidden by bandages. This theme continues throughout the lyrics. One song in particular, "My Horror Mask", suggests at first someone who is uncomfortable with their own physical appearance, and images of "The Elephant Man" come to mind. Closer reading of the lyrics reveals that the song's narrator feels constrained by his public persona and that nobody is aware of his true character due to the disguise he feels compelled to use. This idea is repeated on "I Know You Know My Name", where Johnson suggests that "few have seen my face" and "my words are but an act". In several songs, I thought I spotted lyrics that make oblique references to Piano Magic songs - for example, the opening line of "Save Me" is nearly identical to that of "Vacancies" from last year's "Dark Horses" EP. This may not have been intentional, or perhaps Johnson is hinting that he will never be completely free of that group. For this album, Johnson has moved away from the harsh post-punk guitars of recent work, but not from the Piano Magic sound completely. Much of the album has a fragile, intimate feel reminiscent of 1999's "Low Birth Weight" (the first Piano Magic album that I owned) but with a few unexpected additions. There are frequent folk touches, courtesy of Willard Grant Conspiracy's Josh Hillman. At first this didn't seem like an obvious choice, as I have always considered Piano Magic to be a very English band and far removed from this kind of rural Americana. However, Hillman's strings provide a nice contrast to Johnson's electronics, and also reinforce the air of melancholy that permeates the album. Despite the unrelenting bleakness, I'm certain that "Details Not Recorded" will make it into my top 10 albums of 2009, which probably says more about me than it does about the music. Even if Johnson had intended this to be viewed as something separate from Piano Magic, I will still see it as part of their back catalogue; one of their best releases, in fact. For Piano Magic fans, this is an essential purchase, and for those not familiar with their work, this would be as good a place to start as any.